Alaska has a reputation for being a risky place to fly, a place so dangerous that many insurance companies refuse to provide coverage for flights going into the State. Insurers cite the roughness of the terrain, the narrow and stormy mountain passes, the vast stretches of desolate tundra, the fast-changing weather systems, the winter cold, the snow and ice, the lack of widespread weather information, the lack of terminal radar except for a couple of big cities and a few military bases, the remote nature of many of the towns and villages, the non-standard airstrips, and the lack of communications. They also cite as a problem the mindset of many who fly the bush, considering the area one that attracts wild men -- men with an oversupply of testosterone and an overly macho psychology. To prove their point, they have accident statistics going back for years, and their case is strong. There is a fair amount of truth in all this, but it is not the whole truth by any means. It is my considered opinion, based on better than 22 years of flying the remote bush, that, through knowledge and judgment, northern bush flying can, for most pilots, be as safe as flying in the Lower 48. And for some pilots (those with advanced levels of skill and judgment), it can be considerably safer, for there is far less traffic, and therefore far less risk of a midair collision. Accidents that do occur in the bush are most often the result of pilot error, usually caused by a gross deficiency in judgment. In 1974, after a friend joined the long and depressing list of those I have known who died in preventable accidents, I decided to write this book. My hope was not only to provide a knowledge base to assist in making judgment calls, but to provide as well a psychological perspective that would be conducive to survival. My first problem was deciding what to cover in this book. There are good books on the basics of float, instrument, and mountain flying; therefore, I decided to concentrate on subject matter unavailable elsewhere. In this book I touch upon these subjects only in passing, when their inclusion enhances the subject under discussion. I next had to decide what minimum level of knowledge and skill to assume the reader would bring to this book. 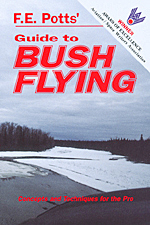 The text covers a broad gamut of techniques, ranging from what a pilot with a FAA Commercial Pilot's Certificate could be expected to handle, to skills so advanced they are only suitable for the seasoned pro. So this book takes the Commercial level of skill as its basic starting point, and goes from there. This book focuses quite a bit on the "pro" attitude, and a definition of pro needs to be made. Pro, as used in this context, does not mean a pilot who gets a paycheck for flying under FAR Part 135. Nor does it mean a pilot who has a FAA ATP Certificate. It refers to an attitude towards flying -- the thoughtful, careful approach that is so necessary for safe operations. FlightSafety International claims that the best safety device in any aircraft is a well-trained pilot; I believe the best safety device is a thoughtful, aware, careful pilot who knows how to exercise judgment. Training is very important (and dare not be skimped), but attitude is even more important.